Selfie phones are a huge hit nowadays. Following this trend, most of the mobile makers shifted their focus to the camera duo. Oppo has taken things forward by releasing a mobile with best cameras. On the front, the new Oppo F1s is equipped with 16MP selfie shooter and gets a 13MP rear snapper with LED flash and phase detection autofocus. Coming to the remaining Oppo F1s specifications, it is packed with octa-core processor coupled with 3GB RAM. As for the display, the Oppo smartphone gets a 5.5-inch HD display and is covered by the corning gorilla glass 4. Like Oppo R7 and Oppo F1s plus, the mobile stays charged for many hours and is powered by 3075 mAh battery with turbocharging feature. This oppo f1s in India is priced in a decent range and competes with another selfie phone, Gionee S6. Current F1s price in India is between ₹17000 - ₹18000. Oppo F1s has many positives like a battery, Camera duo, under hood hardware and everything. This device is packed with many brilliant technical inputs that boosts the performance and experience. Other than the non-removable battery and lack of FHD display the mobile has no major turn downs. Like Oppo R7, Oppo F1s is also slim, impressive and a reliable performer with an excellent battery backup. On the design front, the mobile gets a sturdy built with the complete metallic finish. On the rear, the matte look gets more brownies than the glossy front. When compared to the predecessors Oppo A53, this mobile didn’t get any huge design changes yet it managed to stand out in the crowd with its good looking finish. The mobile features a large 5.5-inch LCD display with good viewing angles. It lacks Full HD resolution and settles for HD resolution at a pixel density of 267 ppi and gets Gorilla Glass 4 protection. However, the display suffers a bit in direct sunlight even when brightness is at optimum. Fueled by 3075mAh battery, the mobile works for a whole day on a single charge even on a 3G network. Although gaming consumes the battery a bit more, the faster charging feature balances the loss within no time. Under the hood, the 64-bit octa-core MediaTek processor accompanied by 3GB RAM performs well without any lags while multitasking. Gaming is yet another wonderful experience in this new Oppo F1s. Powered by Mali-T860 MP2 GPU, the graphics are stable with low frame drops. This selfie expert gets a 13MP rear shooter with LED flash, ultra HD mode, and PDFA. On the front, the 16MP selfie snapper captures beautiful selfies with some filters and gets a GIF, double exposure mode. The camera duo works wonderfully in both day and low light areas with balanced sharpness. 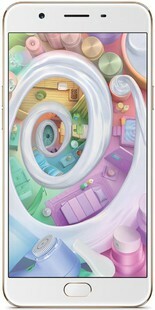 Other Oppo F1s specifications include a 32GB internal memory that can be expanded up to 128GB thus aiding in storing high-resolution pictures. In a word, Oppo F1s delivers where it needs. Both the Camera and battery deliver utmost performance. With all the finest features, Oppo F1s is in a tough race with Xiaomi mobiles and Motorola smartphones. Oppo F1s full specs and reviews as of Apr 2019. Buy it here!